GEI Works is committed to providing you with the best solutions for fire protection and our Centaur Folding Frame Tanks are no exception. In emergency situations, safety and security and high-quality and fast deploying equipment is paramount, and the Centaur Frame Tank has been designed with this in mind. Each tank uses high quality aluminum or steel frame, and durable liners capable of holding up in challenging situations, all while providing the simplicity and ease of use that comes along with our collapsible water tank design. Capable of adapting to urban, rural, and remote situations, Centaur Frame Tanks come in several different sizes. The single-fold configuration is designed to fit within the confines of a single lane, making it ideal for small residential streets and narrower response zones. And when used in wider response spaces, we offer an optional double fold configuration, as well. Both the single and double fold configurations of Centaur Folding Frame Tanks are listed at a standard capacity from 500 to 5000 gallons, which can double or even triple the commonly available emergency water supply by manifolding a series portable tanks to suppress fires, and this extra capacity can save you time and energy when in the field. Our open top tanks ship as one piece and are ready to use on receiving with no assembly required. Capable of being set up or collapsed by just two people, the Centaur Folding Frame Tank can be deployed, filled, and ready to use in minutes. After use, it can be emptied, collapsed and folded flat quickly for transportation and storage. Water storage in remote locations can often prove to be a challenge. But a collapsible frame tank, acting as a temporary reservoir forfire suppressing water can be erected, linked together in a manifold through the discharge valves on each tank, creating a string of tanks that can be pumped or pulled from. 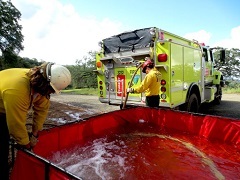 This greatly increases the speed of water distribution and can allow remote, and rural, fire fighters to take advantage of more isolated water supplies than may otherwise be accessible. With a more dynamic approach, larger fires may be brought under control in shorter time frames with efficient use of local resources. Need additional site specific fittings for your folding water storage tank? Please do not hesitate to contact our sales team at 772-646-0597. Outside of fire suppression, Centaur Folding Frame Tanks have been used in other emergency response situations, such as disaster relief, hazardous material spills, and oil spills. As a result of their portability, simplicity, and durability, they serve as an efficient holding tank for potable and non-potable water following natural disasters, and because of durable lining materials used in Centaur frame tanks, they can store harmful chemicals, pollutants, and spilled oils. *Please provide a safety Data Sheet (SDS) if the liner will be in contact with liquids other than water for appropriate material selection and suitability. For more information, please visit our Centaur Frame Tank Specification page or our Centaur Frame Tank Overview page.